Picture Book Review: This is a Taco! 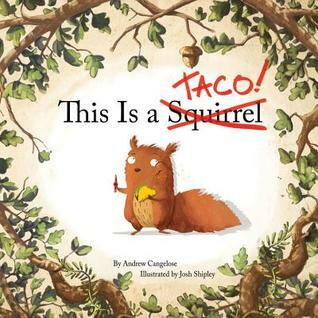 Taco is a squirrel who loves to eat tacos, and he agrees to be in this book to teach young children about squirrels, with the understanding that there will be tacos in the book! But Taco gets more than he bargained for when he is mistaken for a flying squirrel, forced to eat tree bark, and hunted by a ferocious hawk. Can Taco take back control of the narrative before it’s too late? I love books that break down the fourth wall, especially picture books. As Taco becomes increasingly anxious about the chaotic turn the story is taking, he does a beautiful job of addressing the reader directly and including the audience in the book narrative. The writing is quite clever, and similar to another favorite picture book, The Monster at the End of this Book ! The illustrations are so lovely! Colorful and funny, each page has a charm all its own. Taco is so cute!! He’s cuddly and adorable, and I love his funny facial expressions. I like that Taco is single-minded about wanting his tacos, and he takes charge of his own story to make sure he gets the happy ending he desires. He’s a fun and likable character, with some slapstick jokes and general silliness.